Alessi’s fun Pino funnel was designed by Stefano Giovannoni and Miriam Mirri. The funnel features the face of Pinocchio, and the narrow stem depicts his long nose. 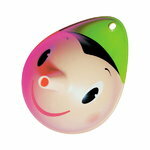 Hang Pino in your kitchen and bring joy to home chefs of all ages. The Italian architect and designer Stefano Giovannoni (b. 1954) studied at the University of Florence in the 1970's. Together with Guido Venturini he founded the production company King-Kong in the early in 1980's. He has designed for example the Girotondo and Mami product lines for Alessi and the Bombo product family for Magis.